Text-Driven Preaching, What is it and How to communicate it? The crisis of gospel witnessing confronts many churches today. It confronts many believers as well. Baptisms are in decline. Church membership is on a downward trajectory. Church attendance continues to retract. Gospel conversations have decreased while lostness around us has increased. And this leads us to an all-important question: Why? Join us as we consider the major methods and strategies of evangelistic preaching from the Book of Acts. Christians today are at a crossroad between Christ and culture. The world claims that the church “is on its way out.” The Bible teaches that believers are “on our way up.” As Christians, we live between two worlds. We are foreigners in a strange land. Take a quick journey through the Book of 1Peter as we understand that those who do the most for the present world are simply those who think the most of the next. From 25 years as a Logos user, Dr. McCarty shows how his top five Logos Bible Software resources can help text-driven preachers discover the substance, structure, and spirit of a biblical text. Discover how clausal outlines, discourse data sets, visual filters, exegetical summaries, and special lexicons can help you get from the study to the pulpit in less time and with better sermons each week. This breakout session will examine and highlight the historical contribution and continuing impact of the preaching and pastoral ministry of Charles Simeon (1759-1836), who pastored the Church of the Holy Trinity in Cambridge for more than 50 years. Particular emphasis will be given to the “text-driven trajectory” of his teaching and practice of preaching. The session will also address key principles for pastoral perseverance which may be gleaned from Simeon’s experience as a pastor. God said what He said on purpose. Though He does not owe me a “because,” His Word defines and defends the truth. In a culture of “do whatever seems right to you,” the church must regain her voice and passionately defend divine expectations. God’s Word is not merely His advice to generations long gone by, it is His intention for His people throughout time. It is enough to say that God’s Word is true simply because He said it, but this session will examine why theology matters for the church today. The connotation of the word “prophet” today doesn’t quite capture the essence of those who held that title in the Old Testament. God’s spokesmen were timely and courageous; their messages were instant and in season. Yet preaching Old Testament Prophecy is more than just explaining someone else’s arraignment. The Prophets speak truth for today. In this session, we are going to look at how to understand and preach the Old Testament Prophets. How can emotion both and enhance and detract from the true meaning of a text? This session cautions against the dangers of human personality in preaching while also exploring the value of exegeting and utilizing the Bible’s emotive intent for effective sermon delivery. Authentic expository preaching is more than explaining the text – it is applying the truth of the text to the lives of the listeners. 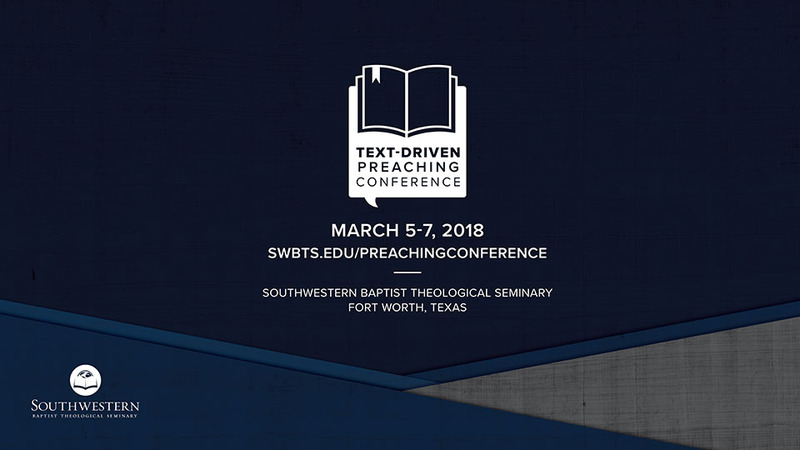 This session will emphasize the urgency of application and explore steps to develop sermon applications that are true to the text and relevant to life. When you are done preaching, do your listeners have a clear idea of what the sermon was about? One of the keys to effective exposition is focusing on a key principle that drives the text, which can be called the “Take Home Truth.” This session will discuss why this key idea is needed and will offer steps to create an effective Take Home Truth for your sermons. Effective biblical exposition involves bringing God’s Word to bear on every aspect of your listener’s personality, including the intellect, emotions, imagination, and volition. Discover proven strategies for connecting Bible truth to peoples’ lives. A strategic plan for preaching can become one of the pastor’s most powerful tools for communicating vision and bringing spiritual transformation to the congregation. Learn an easily adaptable system for planning a yearlong preaching calendar. How important is application to the overall effectiveness of the sermon? If transformation is the goal, application is indispensable. This session will demonstrate the undergirding philosophy of application and show the connections between application, explanation, and illustration as they relate to fostering understanding in the listener. I recently transitioned from one church to another church and feel like the Lord gave me some great wisdom on how I (as a leader) could prepare well and set the transition up for success. This session would give practical advice and suggestions to pastors that are preparing for or walking through a transition. If I would have had a cheat sheet in school with all the answers, I would have probably done much better on my tests. In a similar way in this session, I will reveal many of the leadership lessons I’ve had to learn the hard way in ministry. I’ll include several things I’ve learned from my pastors/mentors throughout the years (Charles Stanley, Ed Young, Jack Graham, David Landrith, etc.). It has been said that a church’s culture is the most powerful social reality in congregational life. How can a leader shape or change the culture of the church? This session will examine the twin motifs of teaching and table fellowship in Luke-Acts and consider how a leader can lead congregational change through Biblical exposition and hospitality. Many churches are committed to a model of Biblical exposition in the pulpit but revert to a topical model for personal or small group discipleship. However, if churches are to be thoroughly text-driven in their commitment, then what is good for the pulpit should be good for the Sunday School classroom. This session will explain how an expository approach to the Sermon on the Mount can be used as a resource for personal and small group discipleship. The life of the pastor is one of endless tasks and constant challenges. We must be intentional in how we maintain our primary ministry to our wife and children. We will encourage one another in how to this sacred gift. We recognize that the life and ministry of the pastor is a marathon and not a sprint and there are many dangers along the journey. We will challenge one another in this session to run in wisdom and finish the race. Session 1: Leading the church has never been an easy assignment, and in today’s changing culture it’s even more challenging. Yet, we have a divine calling to minister to those we’ve been called to serve effectively and efficiently. In this session, you will learn Biblical principles that will better equip you to lead the local church well. Session 2: Being a pastor isn’t for sissies, and it certainly isn’t for those who are lazy. If you’ve been called by God to serve as pastor of a local church, then you have a divine calling to effectively and efficiently lead your church to equip the saints for the work of the ministry and carry out the Great Commission. In this session, you will learn some practical ways of reaching people with the gospel, overcoming common obstacles, and developing leaders to come alongside you as you seek to lead your local church well. Pastor Ken Whitten will be speaking on how to be a caring shepherd to wandering and wounded sheep. In this session, we will work through the process of preparing to teach the Bible, by going step-by-step through a specific text. Once you have done the exegetical and hermeneutical work, now what? We will build upon Session A by taking what was learned in the preparation stage and creating a teaching session or expositional message. This session will help women effectively deliver the message as we deal with voice, stage presence, emotion, distractions, and unique challenges for women as they teach. As women, we often find ourselves in the position of second chair leadership. That is, we serve under someone else. Serving from the second chair does not mean I am less than a leader, have less ability, or less influence, it is simply the position and part I have been given, and my responsibility is to do my part with as much skill and ability as my organization’s first chair leader. Sometimes this comes easily. Other times, leading from the second chair is hard. This session will help women leaders thrive as second chair leaders. In this session, you will learn about key resources that are readily available to help you prepare a Bible Study, devotional, teaching session or message. Time will be spent looking at specific resources, tips, and tools to aid the Bible teacher. This interactive session focuses on taking everyday things, past experiences, stories, etc. and creating illustrations, introductions, or points of application from them.